Pool waterfalls and fountains are, perhaps, the most fascinating kind of water features. They are the most valued and appreciated water attractions among the many options for fun accessories like slides, springboards, etc. as they can be used as a decoration in both large and small swimming pools, even in children’s pools. The unique properties of falling water were highly appreciated many centuries ago – just think of the famous fountains of Versailles or Rome. The sparkling streams create a feeling of complete peace and tranquility. Modern technologies allow you to get your own waterfall as these fascinating water features are designed to replicate the charm of the natural ones. The perfect, free falling veil of water embodies the harmony of nature and inevitably becomes the magic center of attraction. Waterfalls for swimming pools create a graceful continuous water curtain and are one of the most beautiful and spectacular elements in any landscape and pool design. 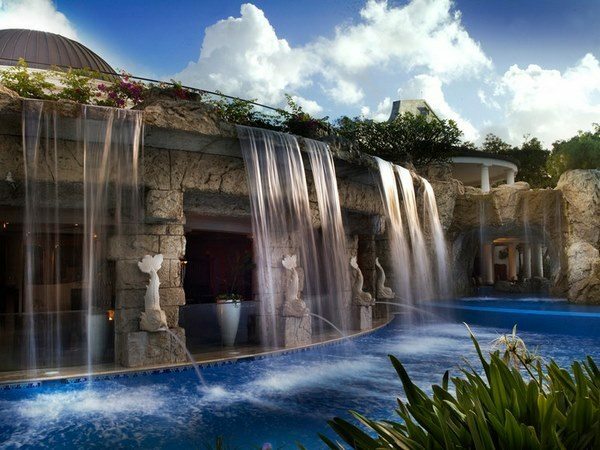 Are pool waterfalls a luxury water feature? 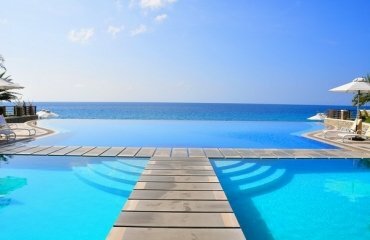 Nowadays, pool designs offer a variety of shapes, sizes, finishes and having a pool in the backyard is not considered to be a luxury. We have seen many original designs – from round, square, polygonal, curved to pools with most bizarre shapes. 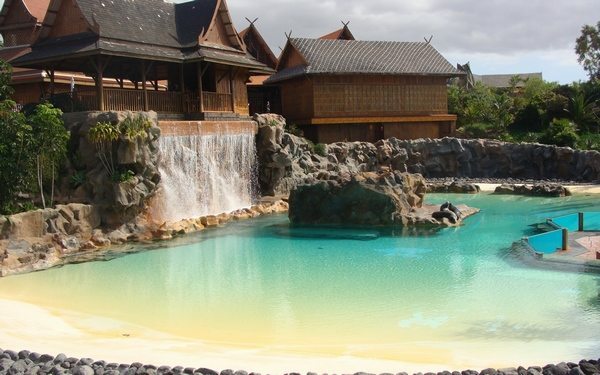 However, it is the truly individual and unique attractions like waterfalls that transform an ordinary pool into an exclusive one. In addition to the decorative functions waterfalls have a therapeutic effect. Acting as a hydro-massage for the back, shoulders and neck, they can help relieve tension and stress accumulated during the working day. Just a few minutes under the water flow from the waterfall will make you forget about fatigue for a long time, fill every cell of the body with energy and strength. Many people ask what the benefits of pool waterfalls are? On the first place, such water features add elegance and style to your swimming pool – whether indoor or outdoor. People have been fascinated by water and fire for thousands of years and all of us can watch for hours the dance of flames and the water flows. 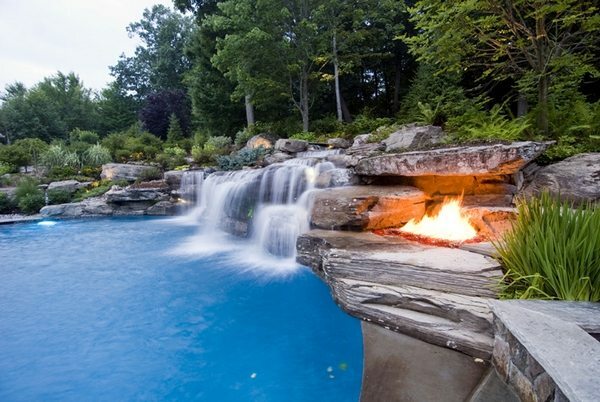 You can add a waterfall to an existing pool and spice up its appearance. The good news is that waterfalls come in a huge variety of shapes and sizes which means that you can find the right one which will complement your pool. Some people prefer rock waterfalls, others choose more modern designs, but in any case, such an addition to your pool adds financial value to your property in addition to the aesthetic appeal. You can add LED lighting or fiber optic lighting which will make your waterfall an amazing element of the exterior or interior decoration. Another benefit of having a waterfall is the sound of moving water which has a soothing effect and the mood of a person changes dramatically for the better and everyone receives a huge charge of energy for a long time. From a practical point of view, a waterfall aids the filtration of the pool as it keeps the water constantly moving and moving water gathers no algae. This makes the water in the swimming pool safer and cleaner. As you see, installing a waterfall will be a highlight to the interior of the pool and a bonus will be a great mood, a good physical shape and the possibility of relaxation at any time convenient for you. What are the most popular pool waterfalls types? Waterwall – usually this design is used when the goal is to imitate individual elements of the natural landscape – water can flow picturesquely along wild boulders, or through a system of specially prepared ledges, cascading from a predetermined height. 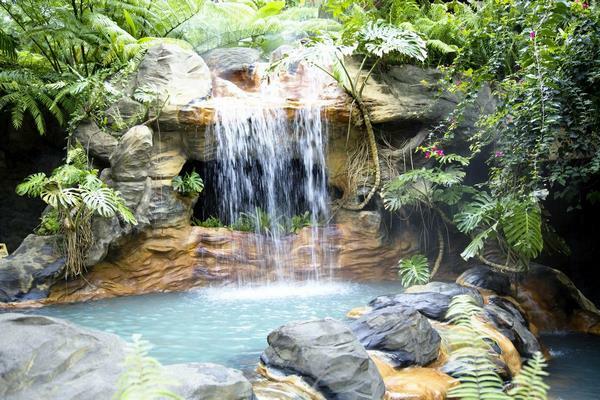 Rock waterfalls are quite popular and often used for tropical themed swimming pools. 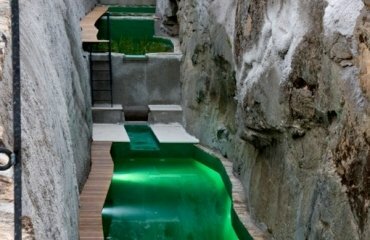 They look like natural rock formations and the size and design may vary significantly depending on the size of the pool, the personal preferences and taste of the homeowners, as well as the area limits. You can see simple rock waterfall structures and complex ones, equipped with lighting, but the more complex the structure, the higher the price. 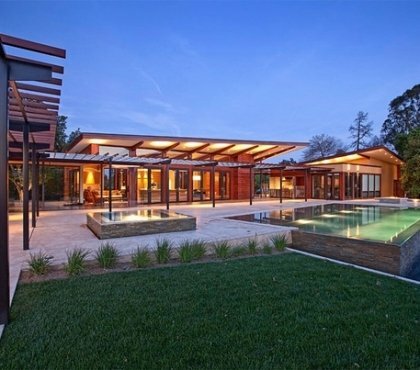 Sheer waterfalls are an excellent choice for contemporary and minimalist designs. They offer the waterfall effect but come in a wide variety of sizes and due to the simpler design they can be installed pools of almost any size. Pool waterfall shaped as an umbrella or mushroom are most suitable for children’s pools as they can be installed at a shallow depth and they do not require a strong water pressure. Jet water cannons are usually seen in public swimming pools. They produce a powerful jet of water, which has an excellent hydro-massage effect but standing under the stream of water for a long time is not recommended, as it may cause bruises. 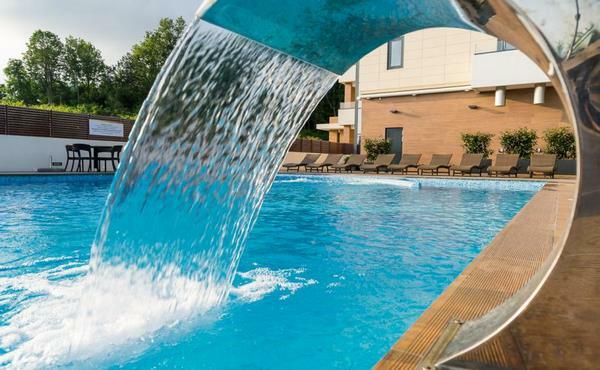 The design of pool waterfalls is based on a number of basic elements which provide the proper functioning – the “heart” of the whole structure is a pump, through which water flows from the pool through suction nozzles. After acceleration, the water under pressure comes into the nozzle of the waterfall, from where it flows. Obviously, customers do not need to know the technical side in details –pipes, pumps, controls, etc. Piping, power supply, water source – all these factors need to be carefully considered as well. Pool design companies are professionals in the design and installation and, frankly, installing a waterfall in a pool is not exactly a DIY project, is it? 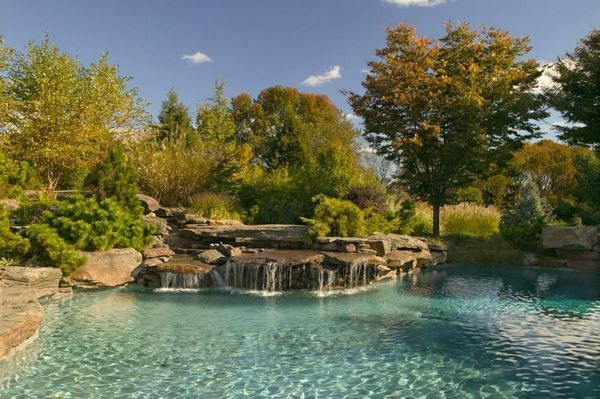 However, when you wonder whether to have or not a waterfall in your pool, there are some considerations to keep in mind. 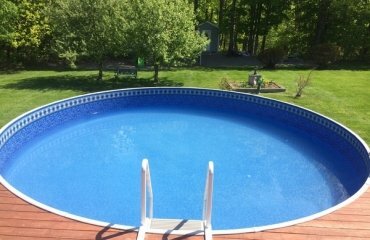 Where to install the waterfall for your pool? Consider the appropriate depth of the pool at the location of the waterfall. Obviously, it is best if you plan the installation of a waterfall at the design stage of the pool. 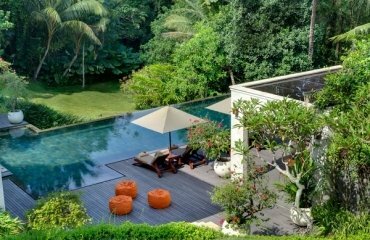 Having in mind that the entire structure of the waterfall is a separate set of equipment that does not communicate with the general water supply and cleaning system, the earlier you plan any extra features for your swimming pool, the better. Planning in advance will allow you to create unique designs and combine them harmoniously with other elements. This does not mean that you cannot add a waterfall to an existing pool but such a project will require more effort and you may be limited by the existing piping, available space or other obstacles. Another important consideration is the size of the waterfall – small, medium or large. This affects the price of the stricture itself as well as the cost of installation. Some customers prefer pre-made models while others choose custom designs which are more costly. Choosing the material will also affect not only the visual appeal but the price of your waterfall. Of course, the design determines the materials and there are numerous options to choose from. For example, rock waterfalls are especially attractive but instead of using solid rock, you can opt for faux stone or lightweight composite materials with natural rock coatings. Style – this is another factor that you need to consider at the planning stage. When you add a waterfall to an existing indoor or outdoor pool, it should work with the overall exterior and landscape design, respectively with the pool house interior. Whether traditional, modern, tropical or minimalist – style options are quite many to satisfy every taste and personal preferences. Details always add charm and personality. 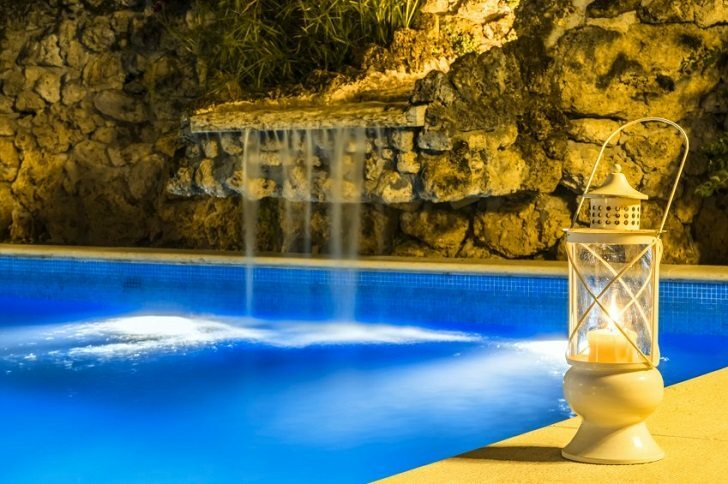 Additional features like lighting, fire features, grottos add to the visual appeal of the waterfall and the overall appearance of the pool. You can add a variety of fire bowls, round or linear fire pits which will have a stunning and dramatic effect at night time. Decorative lighting enhances the beauty of the waterfall and you can arrange striking light accents. 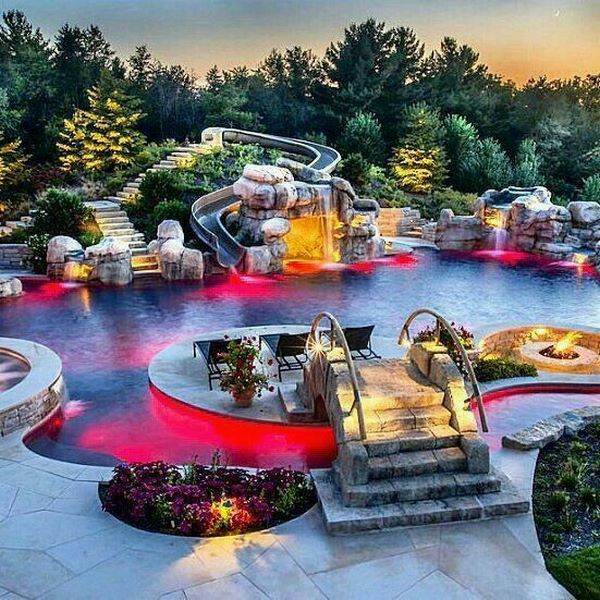 Using pool lighting in a creative way will transform the pleasure from visiting the pool into a unique and magical adventure. You can choose decorative lighting which colors the water in different colors that can change and create the illusion of movement, or blink, or smoothly change from one shade to another. 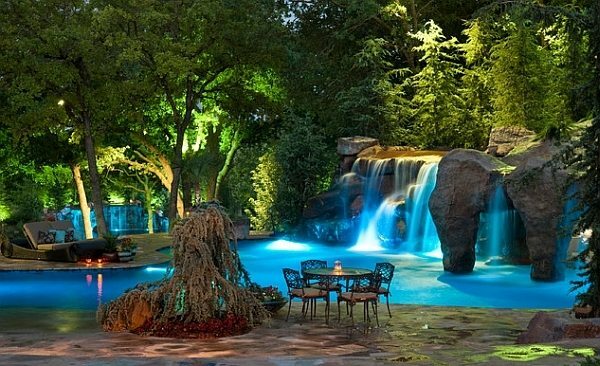 Backlighting a pool waterfall is another possibility which creates a stunning visual effect. 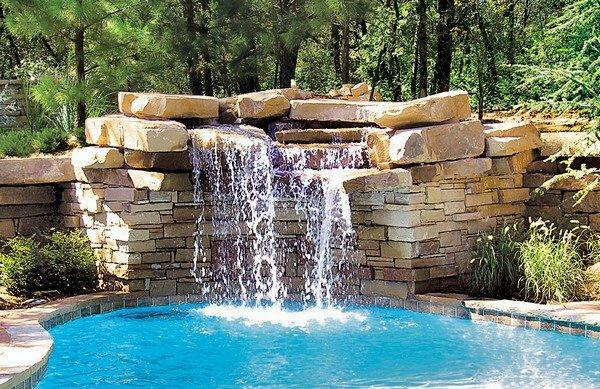 In conclusion we have to say that pool waterfalls come in such a huge variety of designs, materials, additional elements, etc. that they have become a feature that contributes to the great mood throughout the day and offers the joy of hydro massage, relieving stress, improving physical fitness, etc. Why not enjoy the many benefits of adding such a water feature to your pool? Look at the selection we made for you and see which pool waterfall will be the best choice for you!